When life begins to feel complicated, I take a moment to reflect on the meaning of happiness and what it is for me. Is it really a bigger house, more money, an expensive bag or things like that? Yes, I would be lying if I said these things didn’t make me feel good at all. It does, but for that moment and may be a few days more. The only problem is if I continue to seek happiness in such things, my definition of happiness will keep getting complex.. and there’s really no end to it. There is always a want for more… and more. Nothing wrong with it but I find it important to take a moment, think back and put things in perspective. An unknown, probably insignificant, little flower my child picked up from the roadside. Just for me. Dal-Chawal or Lentils-Rice. A combination which is a staple in India. 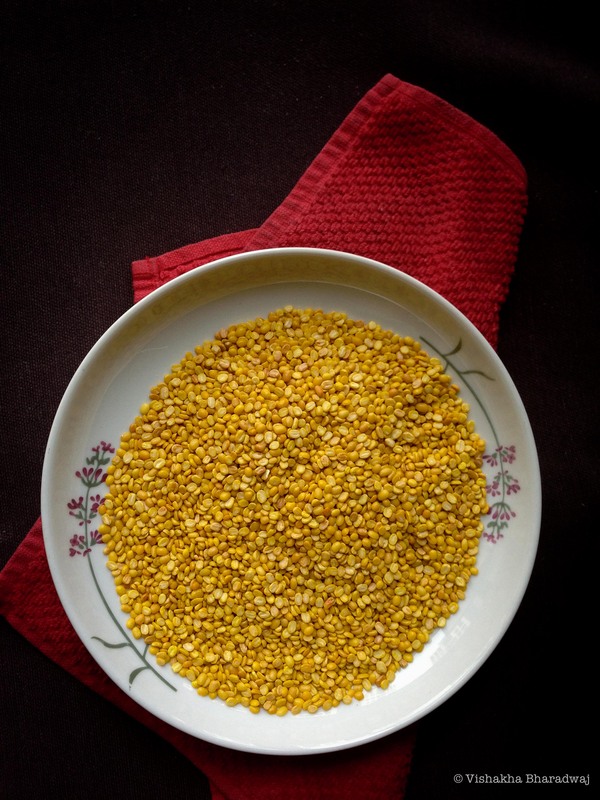 It may be in different variations depending on which part of India or which home it has been cooked, but essentially it is lentils or Dal and Rice. Every time I travel, I immerse myself in the food and culture of that place. It’s an unspoken rule that we never order Indian food when traveling [outside of India]. However, when I come back home, the first meal cooked, without fail, is a very simple Dal-Chawal. I wouldn’t even want to call this a recipe considering this is such a staple in Indian households. I still choose to write the method down as every home has their unique way of cooking lentils. 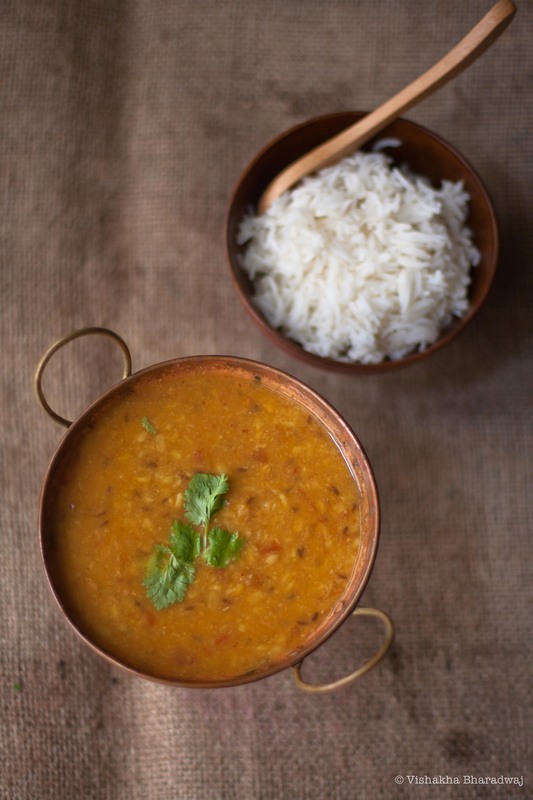 Dal is cooked in a lot of Indian homes, almost every day. And that is also the reason, why one gets bored of eating it ever so often. In order to bring variety to Dal, I like to rotate the kind of lentils I cook. My pantry is stocked with some 7 different types of lentils/beans. I don’t cook Dal all 7 days a week but it definitely finds it’s way to our dining table at least 3 to 4 times a week in various forms. This preparation is quite simple – No onions, No garlic. 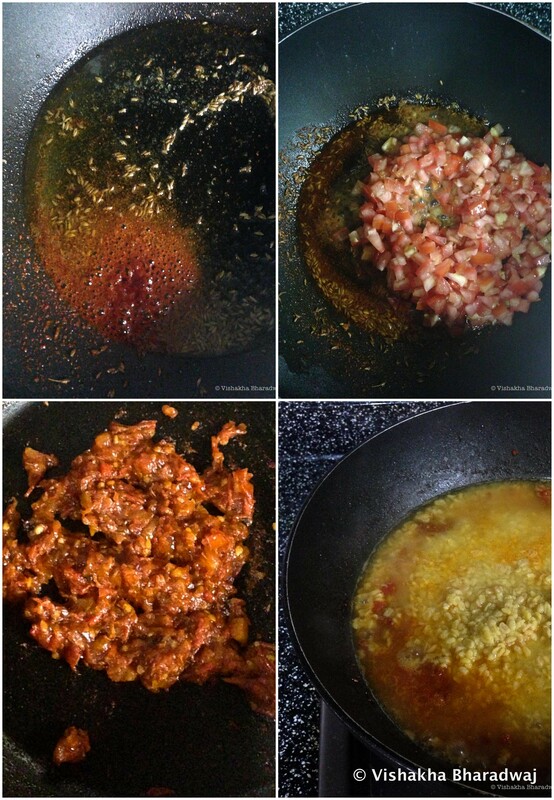 A simple Dal flavoured with cumin seeds, asafetida and tomatoes. The cumin seeds, asafetida and tomato are the main players in this act. 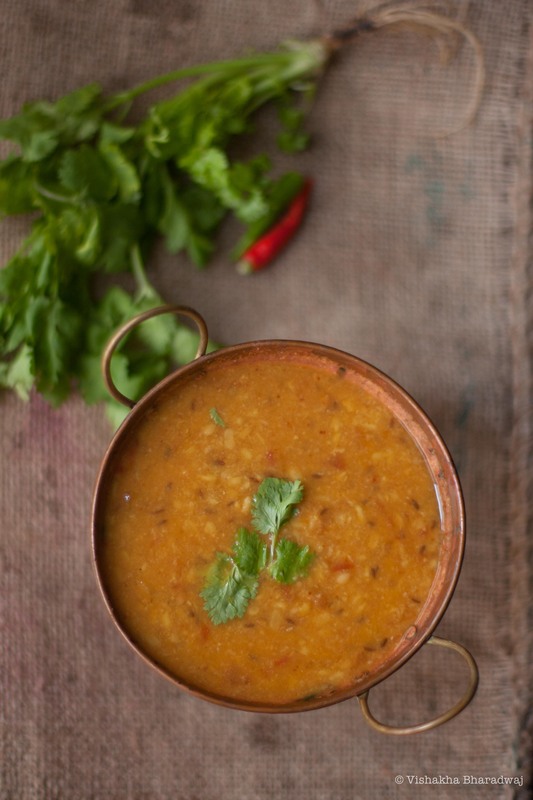 Asafetida gives it a pungent taste and tomatoes add a mild sour flavour to the Dal. It’s a little tough to tell which one is more dominating – the asafetida or the tomatoes, but together, they rule the otherwise modest Mung beans. 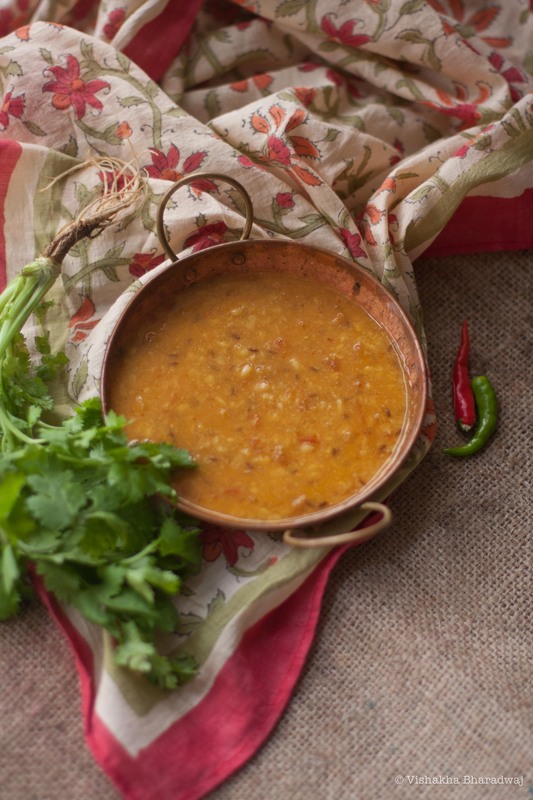 The process of making this Dal is two fold. Part one involves roasting the Mung beans and then softening the beans while infusing it with some fresh ginger. Part two is the tadka or tempering that will add the flavours to the Mung. The tempering is done in ghee or clarified butter with cumin seeds, asafetida, finely chopped (or grated) tomatoes and some Kashmiri chilli powder for a mild spicy touch. I am also sending this recipe to Aparna of My Diverse Kitchen for the 61st edition of MLLA. My Legume Love Affair (MLLA) was started by Susan of the Well-Seasoned Cook and is now being carried forward by Lisa of Lisa’s Kitchen. Dry roast the Mung beans. I do this in a pressure cooker to avoid getting too many utensils dirty. Keep stirring the beans constantly to ensure they are evenly roasted. I did this on medium heat for about 5-6 mins. When roasted, take it off the heat. Rinse with water 2-3 times. 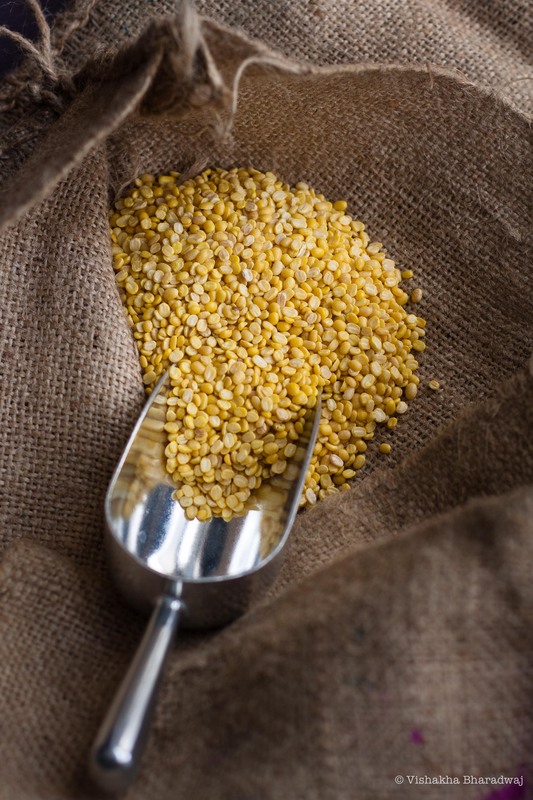 In a pressure cooker, add the rinsed Mung beans, 2 cups of water, a pinch of turmeric, ginger and salt. Cook the beans until soft while still retaining their texture. If you are using a pressure cooker, let the steam build up on high flame. Then lower the flame and let it cook for another 5 minutes until done. While the Mung beans are getting cooked, heat ghee in a pan. Add cumin seeds. When they are done, add the asafetida and chilli powder. Let it cook for a few seconds. Then add the chopped tomatoes and a pinch of salt. 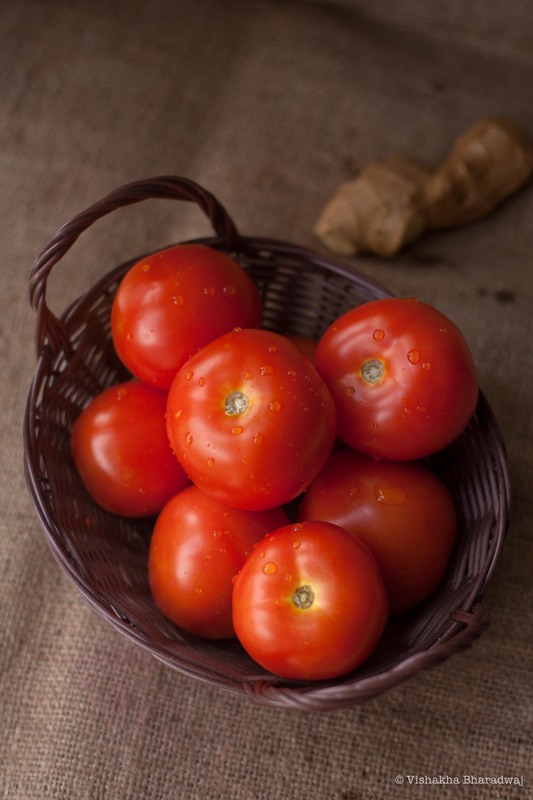 With the heat on high, cook the tomatoes constantly stirring it to ensure they are not burnt and until the raw smell no longer exists. When the tomatoes are cooked, reduce the flame. Add the Mung beans. Add water to a consistency you want and adjust the salt as per your taste. If you want to add chillies, add 2-3 slit chillies (a combination of green and red adds a nice colour.. You can add just green too and skip the drama). Let it come to a boil on high heat and then simmer for 3 minutes. Garnish with coriander leaves and serve hot with rice and any vegetables of your choice. Our favourite Chicken Curry made easy in the Instant Pot! Sweet Potatoes w/ Pancetta, Rosemary and Mandarins.. Let’s get the party started! Aaloo Gobhi, Just like Mom’s! Enter your email address & click the "Subscribe" button to receive notifications of new posts by email. I'm a big fan of cooking nutritious meals and the way I like to do it is to make it fun and delicious by either going the traditional route or creating a variation of my own! . I believe that most traditional home made Indian food is simple, nourishing and healthy. And somewhere along the way, that essence got lost. The good news is that it's coming back with a bang! The world is getting to know more of the real home style regional Indian food, and creating versions of it, and I think these are such exciting times! ⠀⠀⠀⠀⠀⠀⠀⠀⠀ In this picture: A traditional spice mix made with flax seeds called "Teesi" which is a staple in every household in Bihar. It is the most delicious, mildly spicy roasted flax seed spice mix and is great to lift an otherwise dull meal. I've had it at my grandparents home all through childhood. A great accompaniment just by itself or topped with yoghurt. I add it to my vegetable cutlets/patties/tikki which helps to make it healthier! Recipe in blog archives & linked up in my bio. We have such long winters (I am sure other places have it worse.. but please don't forget, I've moved from tropical Singapore). After so many months of the freezing cold, black and white living for all practical purposes, we have so much colour around! It makes my heart full of hope and so happy! ⠀⠀⠀⠀⠀⠀⠀⠀⠀ Sending plenty of happy and positive vibes your way for whatever you may need it for! ⠀⠀⠀⠀⠀⠀⠀⠀⠀ Yesterday, I treated you to our family's special chicken curry. So, obviously, I had to give you a good looking rice to go with it ;-) ⠀⠀⠀⠀⠀⠀⠀⠀⠀ This is another post from my archives from back in the days when I'd started blogging. ⠀⠀⠀⠀⠀⠀⠀⠀⠀ Cauliflower and Peas Pulao getting a face lift with some cranberries, sunflower seeds and pumpkin seeds fried in ghee. [New Post] Today, we are getting personal. ⠀⠀⠀⠀⠀⠀⠀⠀⠀ Like, sharing our treasured family staple chicken curry recipe, personal! I mean, if this is not personal, I don’t know what is? 😉 ⠀⠀⠀⠀⠀⠀⠀⠀⠀ All you need to do is use your imagination and visualize that I have invited you to my home and you’ve come for a meal and you relished the most nurturing, delicious loving chicken curry that you will ever have (apart from the one your mom cooks, ofcourse!) Except, you are the one doing all the hard work you know – the cooking and cleaning up afterwards! haha Oops! you just got a tiny glimpse of my evil side 😉😂 ⠀⠀⠀⠀⠀⠀⠀⠀⠀ Recipe for Our Favourite Chicken Curry made easy in the Instant Pot is up on the blog. Check link in bio. Sublime Palate Create a free website or blog at WordPress.com.